As we approach the Tour de Ski, this is a short assessment of how the US and Canadian teams are doing so far compared to previous seasons. As I typically do, I’m going to include all World Cup results, rather than just the best results. Clearly, there have been some strong results for both the US men and women thus far, but I’m frequently more interested in how we’re doing as a group, top to bottom. For the math-challenged out there, this is every US and Canadian distance result over the past several seasons. 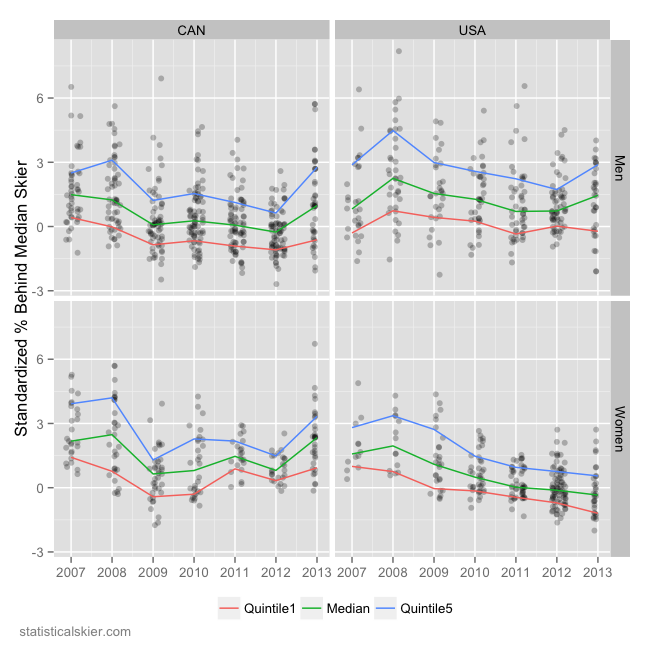 The lines represent the middle (Median) result and the top 20% (Quintile 1) and the bottom 20% (Quintile 5). The Canadians have just generally struggled all around so far. This is essentially the same post, only we’re plotting the final finishing place. It might be mildly surprising to see the US women’s trend lines running basically flat or even sloping up slightly, but if you think clearly about just the results we’ve had so far this season it makes sense. The women have put together some good sprint races, but Kikkan had one “off” sprint race, and Jessie Diggins has only made it past the qualification round once. So if Ida Sargent continues to have a strong season, and Diggins comes along later on, I think we’ll those numbers improve quite a bit relative to where they are now. Once again, the less said about the Canadians, the better, except that I’m betting the rest of the season won’t be this bad. Maybe not awesome, but certainly not this bad. Posted by Joran on Thursday, December 27, 2012, at 6:00 am. Filed under Analysis, Cross Country, World Cup. 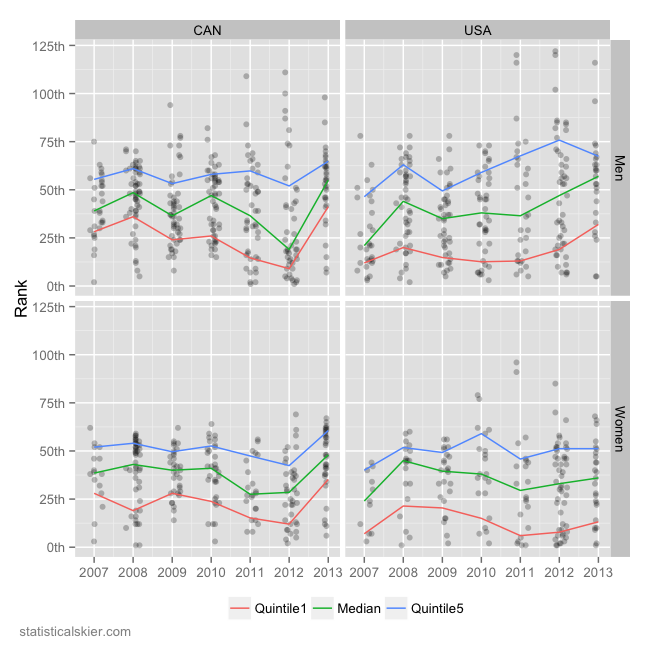 Tagged Analysis, canada, Distance, men, mid season, Sprint, USA, women, World Cup. Follow any responses to this post with its comments RSS feed. You can post a comment or trackback from your blog.